Kathleen Marden is a much respected researcher of the alien abduction phenomenon: Her aunt was Betty Hill, and that initial familial interest has broadened into an expertise of this controversial and emotive subject. In this latest book, she joins forces with experiencer Denise Stoner, whose own remarkable story dominates the first half of the book. Despite the auto-biographical nature of this part of the book, Marden brings a refreshingly objective approach to the subject matter. In a compassionate and measured way, Marden evaluates the events described by Denise Stoner and her family, and becomes a level-headed advocate of their amazing claims. The events include a missing time event on 13th August 1982 in Colorado, which bears some resemblance to the Betty and Barney Hill incident. A second event followed on 20th October 1991 in Florida, both involving Denise and her husband Ed. But there are many more down the years, some of them 'classic' alien abduction events. One associated UFO event was witnessed by Denise's neighbours, adding further credence to her claims. Later in the book, Marden quotes the late Monsignor Corrado Balducci who argues that to systematically ignore the accounts of our fellow human beings undermines a basic tenet of our society - that we may learn from one another. A generalised a priori scepticism can lead to a negation of the human experience (p227). Ignoring the obvious irony of such a statement emerging from a senior Vatican cleric, his point is well made. In light of the numerous institutional child abuse cases across the globe - and how our collective consciousnesses have adjusted to realise how the victims were denied their voice, and their justice, by those in trusted positions of authority for decades - then perhaps a similar adjustment is long overdue with respect to alien abductees? In the absence of a scientific evaluation of the scores of cases available, Marden and Stoner present a statistical breakdown of the 50 cases they have studied, in an effort to find patterns and clues as to the origin of the phenomenon. Far from the 'kooks and cranks' denounced by scientists, who dismiss the entire phenomenon as fantasy, the abductees studied in the book are normal folk from normal backgrounds who have simply experienced extraordinary events. Their joint work is clunkily entitled the "Marden-Stoner Commonalities Among UFO Abduction Experiencers Study", and includes the prevalence of such things as childhood experiences and glowing light orbs. The full results of their study are published in the book. On the basis of this quasi-academic work and a careful evaluation of the various causes of the alien abduction phenomenon offered by various researchers and academics, the authors find in favour of the extraterrestrial hypothesis. Perhaps controversially, Marden uses hypnotic regression to facilitate the awakening of memory of the missing times events. Through this 'forensic' technique - carefully applied, she argues - an entire unbroken narrative of the events emerge. But, she makes clear, many of the extant memories of these incidents are remembered under conscious recall. The second major case discussed in the book, that of Jennie, reveals a shared memory between her and Denise of events aboard a UFO where the two of them are held along with many other abductees. Each woman features in the other's recalled experience (p118). Jennie's own analysis of her nocturnal abductors offers a synthesis between aliens and spirits. There's an inter-dimensional aspect to the phenomenon that defies easy scientific explanation, including the seeming ability of the aliens to move the abductees through walls. Additionally, claims Jennie, the "ETs can insert their consciousness into a ball of light in order not to frighten humans. This is a preventative measure...because human fear leads to hostility and the ETs find human emotions difficult to deal with." (p169) Despite the way such ideas contravene strongly held scientific beliefs, Marden thinks they are important and may lead us towards whatever truth lies out there. Like the late John Mack, she leaves doors open to possibilities other researchers would rather avoid. The last couple of chapters outline several more cases, before drawing conclusions. This is a well-written and thoughtful book which has been carefully prepared and presented. With the exception of the use of the word 'earmark' for 'hallmark' a couple of times, the typos have been weeded out. It indicates that there remain unanswered questions about the alien abduction phenomenon that deserve our collective attentions. 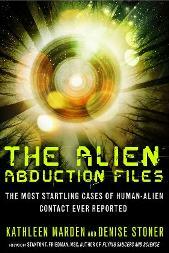 Subtitled "The Most Startling Cases of Human-Alien Contact Ever Reported"